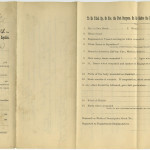 Eligibility to Membership.-Soldiers and Sailors of the United States Army, Navy or Marine Corps, who served between April 12th, 1861, and April 9th, 1865, in the war for the suppression of the Rebellion, and those having been honorably discharged therefrom after such service, and of such State regiments as were called into active service and subject to the orders of U.S. General Officers, between the dates mentioned, shall be eligible to membership in the Grand Army of the Republic. No person shall be eligible to membership who has, at any time, borne arms against the United States. To W. H. Gibson Post, No. 31 Dep’t of Ohio G.A.R. June 11th 1861 for 3 years 2nd Regt. Wis. V.I. sideration of the Post, believing the foregoing statements to be true in every respect. Note.-If any details herein required are omitted, they must be furnished before being reported on by the Committee. Any failure to report all the facts required by this application may render the muster-in null and void. 1 Other enlistments are to be added. 2 If this is the first application, write the word “not” in this space. 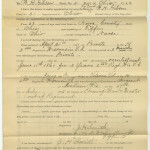 Membership in the Grand Army of the Republic. 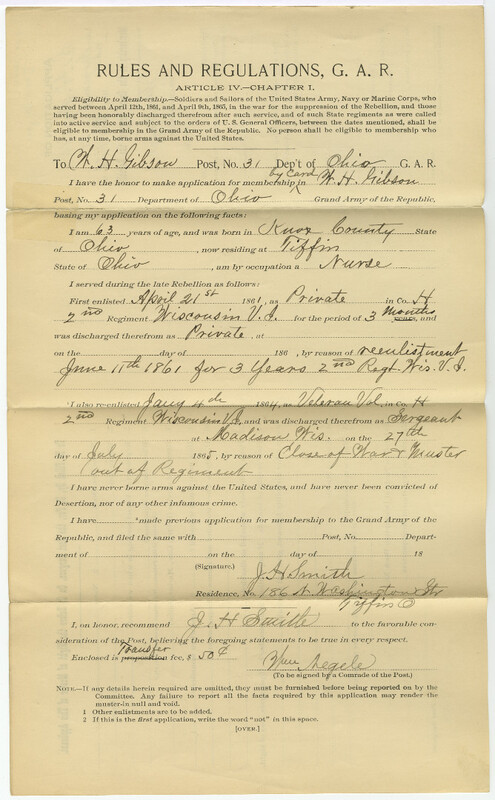 Riverside Printing Co, Milwaukee, Wis.
To Be Filled By, Or For, the Post Surgeon, On Or Before the Night of Muster of This Applicant. 8.How many times wounded? 9. Ages when wounded? 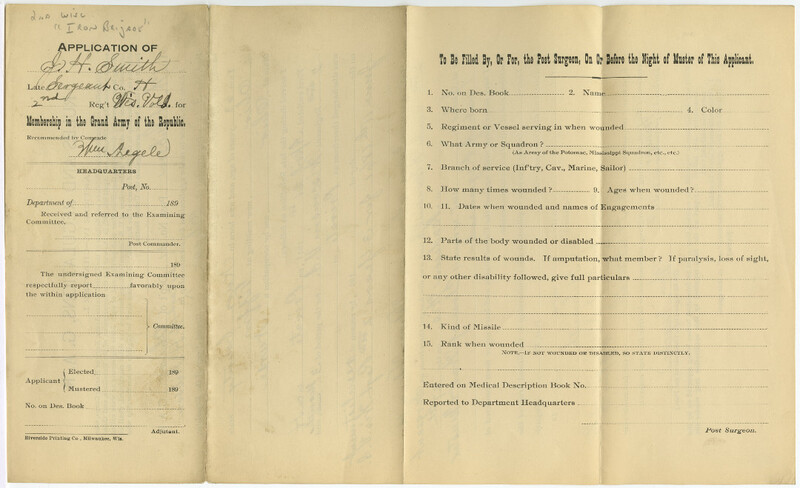 Note.-If not wounded or disabled, so state distinctly. Entered on Medical Description Book No.